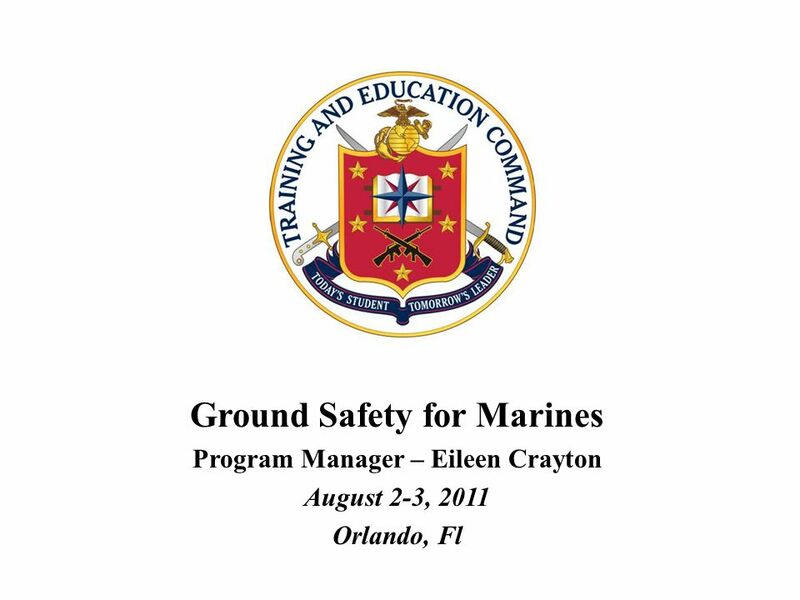 Ground Safety for Marines Program Manager – Eileen Crayton August 2-3, 2011 Orlando, Fl. 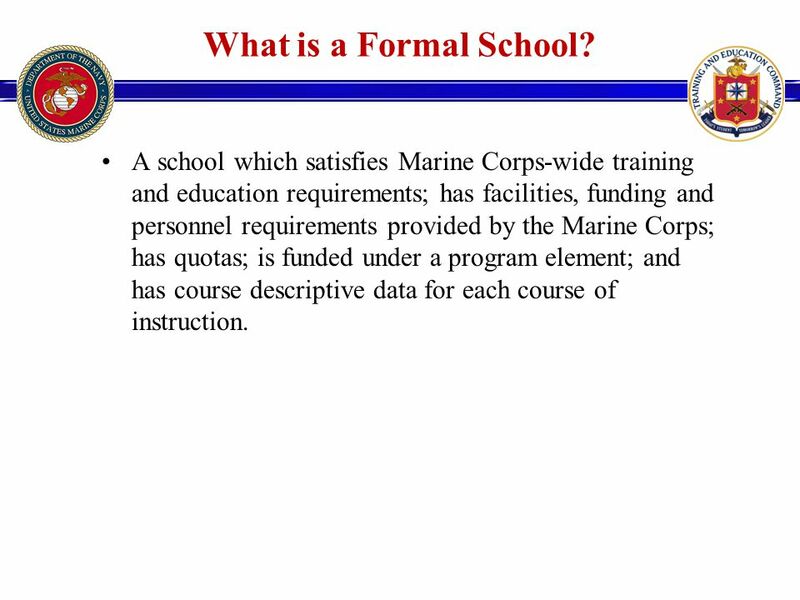 3 What is a Formal School? 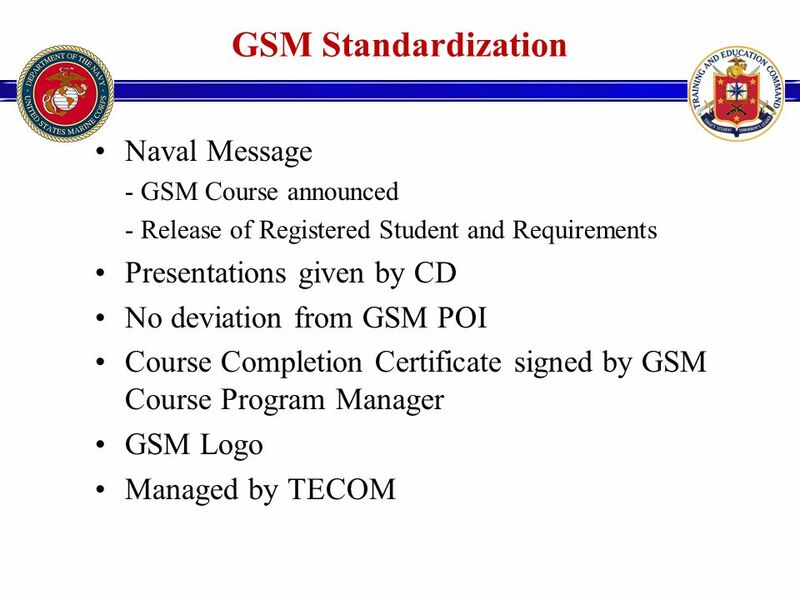 A school which satisfies Marine Corps-wide training and education requirements; has facilities, funding and personnel requirements provided by the Marine Corps; has quotas; is funded under a program element; and has course descriptive data for each course of instruction. 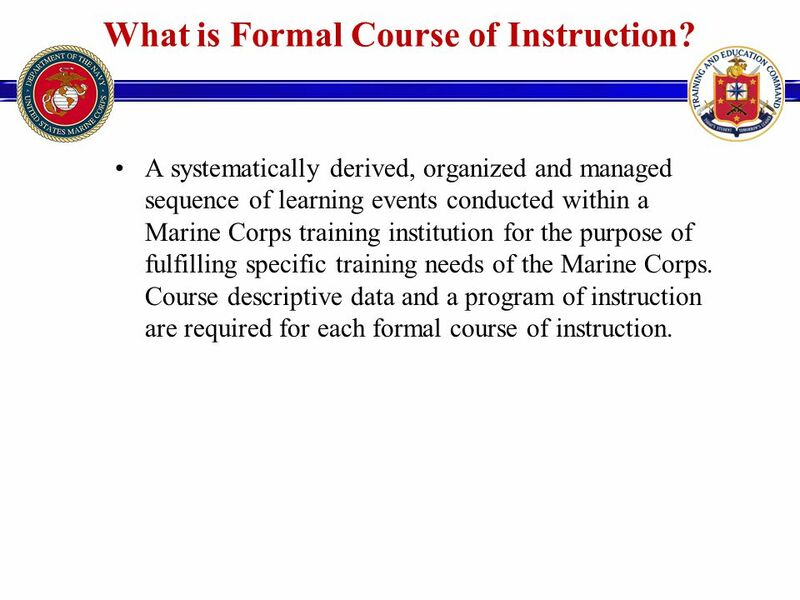 5 What is Formal Course of Instruction? 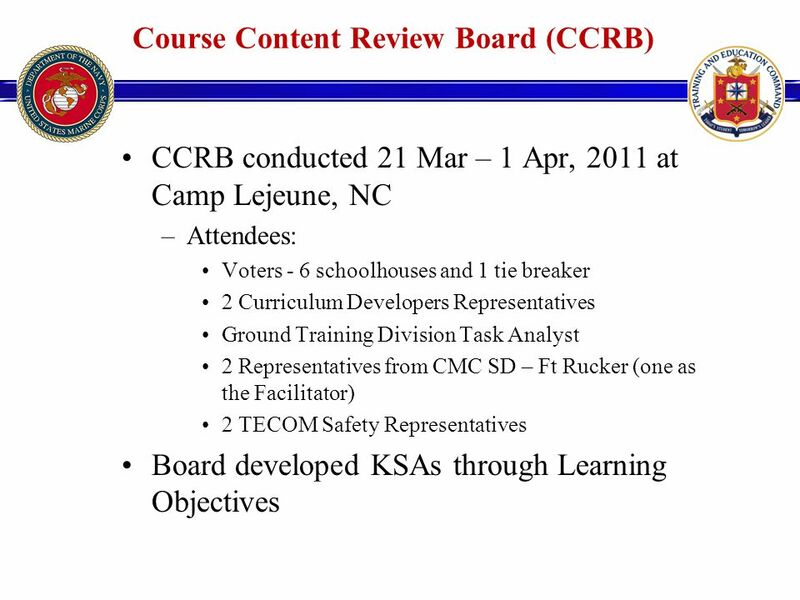 A systematically derived, organized and managed sequence of learning events conducted within a Marine Corps training institution for the purpose of fulfilling specific training needs of the Marine Corps. 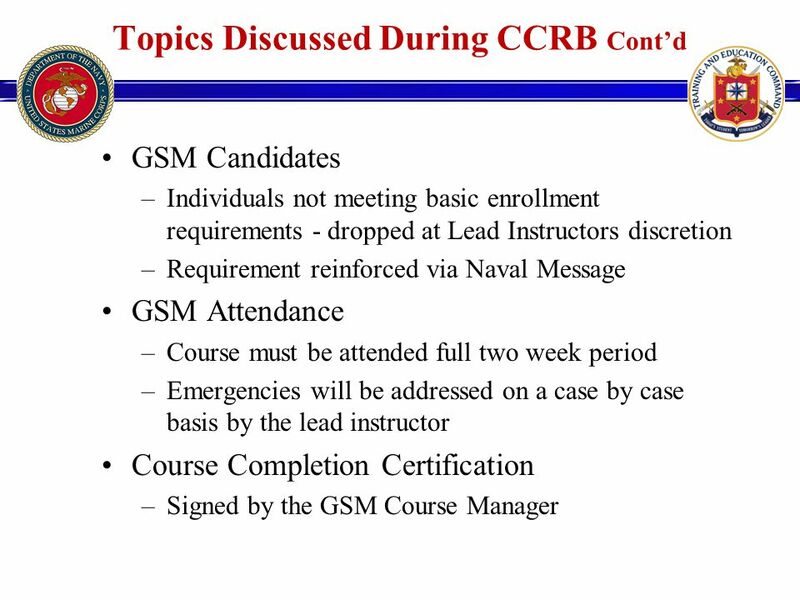 Course descriptive data and a program of instruction are required for each formal course of instruction. 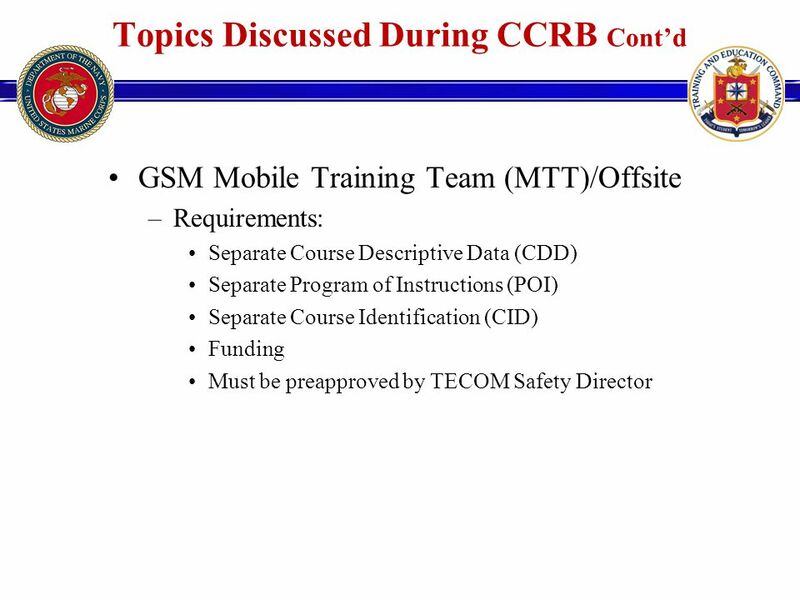 Download ppt "Ground Safety for Marines Program Manager – Eileen Crayton August 2-3, 2011 Orlando, Fl." 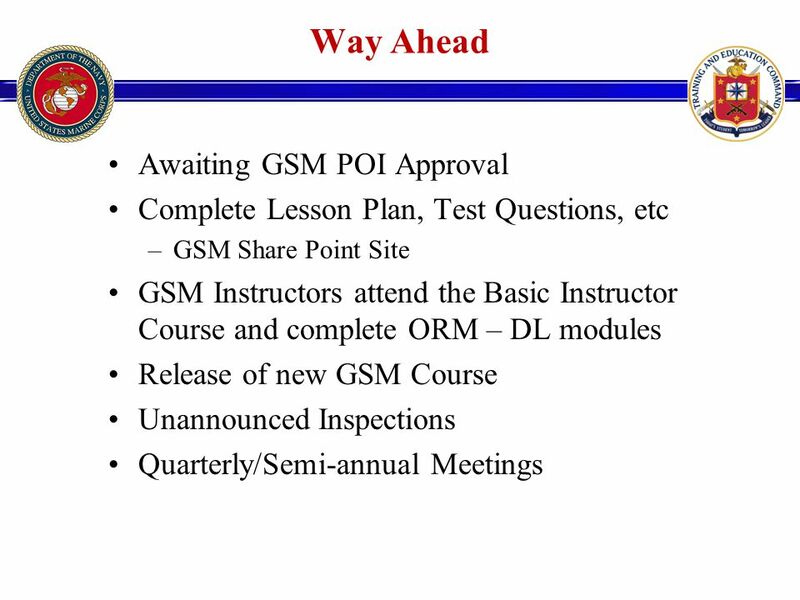 TRAINING PROGRAMS APPROVAL AND INSPECTION. 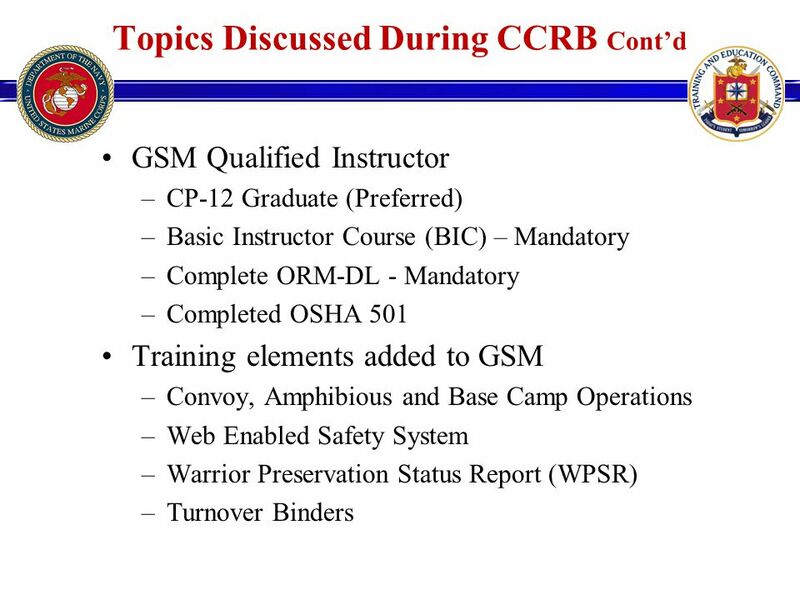 APPROVAL OF TRAINING PROGRAMS Initial New-Hire Training Initial Equipment Training Transition Training Upgrade. ODOT- Office of Environmental Services. How to plan and implement effective Public Involvement Meetings. NCAA Clearinghouse Tucker High School Athletics. 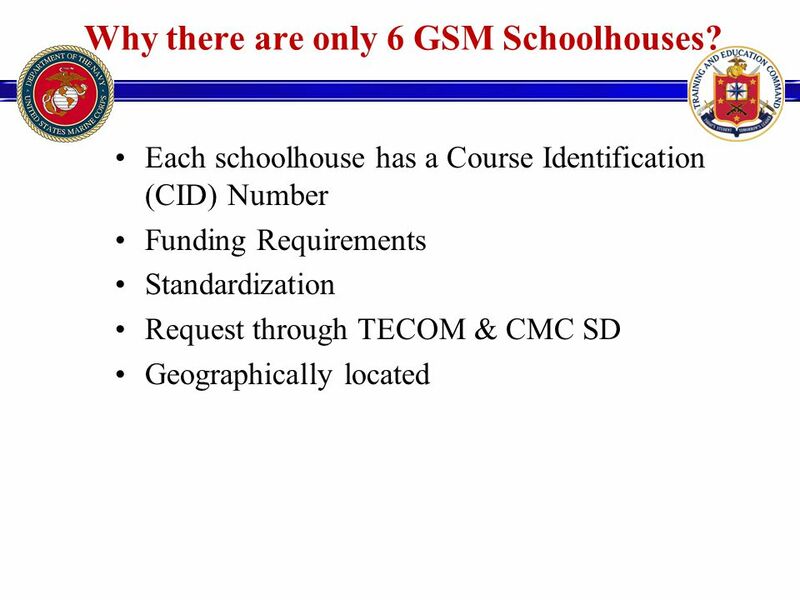 Clearinghouse Information 185,000 students register every year and only about 90,000 are certified 185,000. Quality Assurance / Institutional Effectiveness and Course Syllabi Requirements of the Commission for Academic Accreditation UAE Ministry of Higher Education. Online Learning EDU 640 Michael Fischer, Chris Long, Mike Kroll. 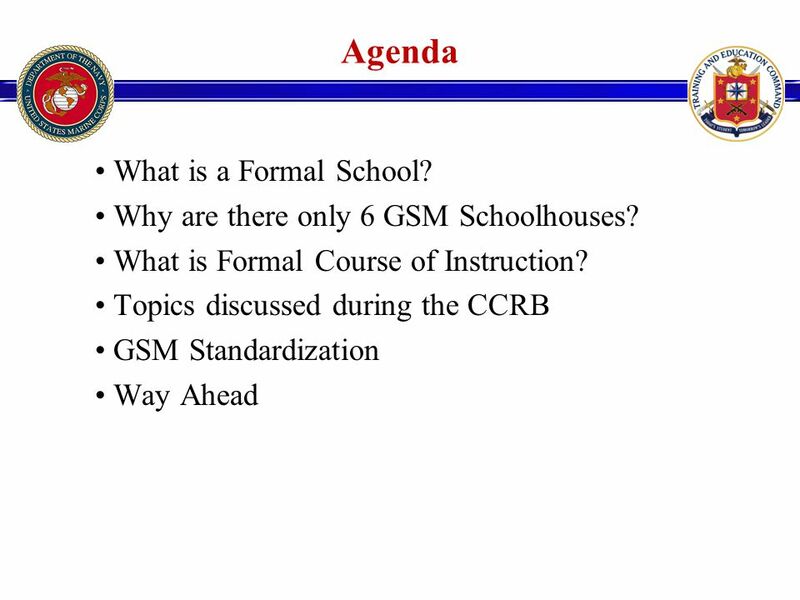 Program Overview and tips for Student Success Gretchen Hayden Director, CT Virtual Learning Center Director, School Partnerships CT Distance Learning Consortium. 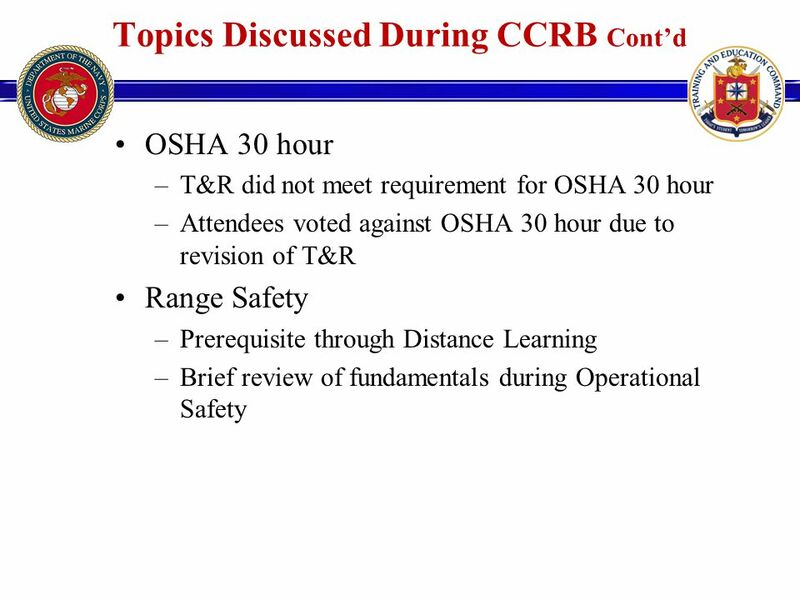 Offsite Storage RAF/2013/00023 Compulsory Briefing Session 16 August 2013 The Road Accident Fund. Field Study Orientation Dr. Len Elovitz. Purpose / To provide you with real experiences that will enhance your probability of becoming a successful supervisor. Chesterfield United F.C. 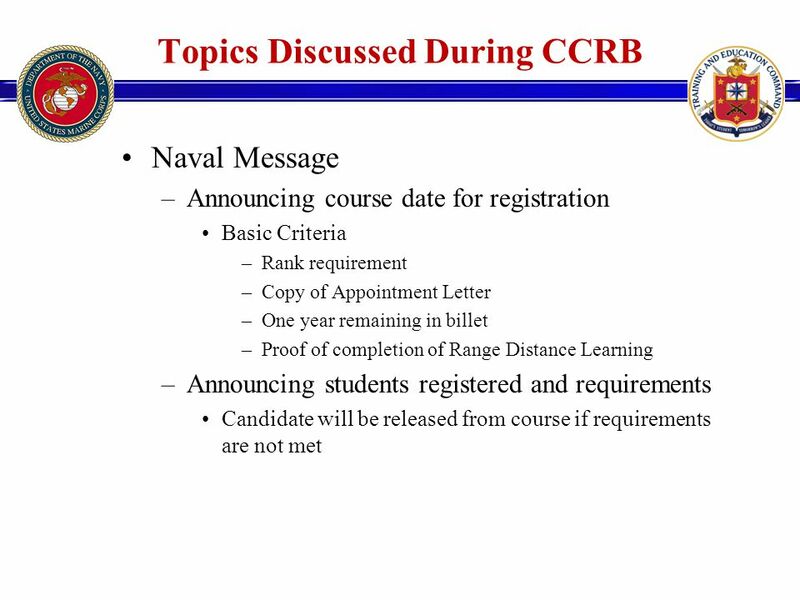 College Guidance Program. 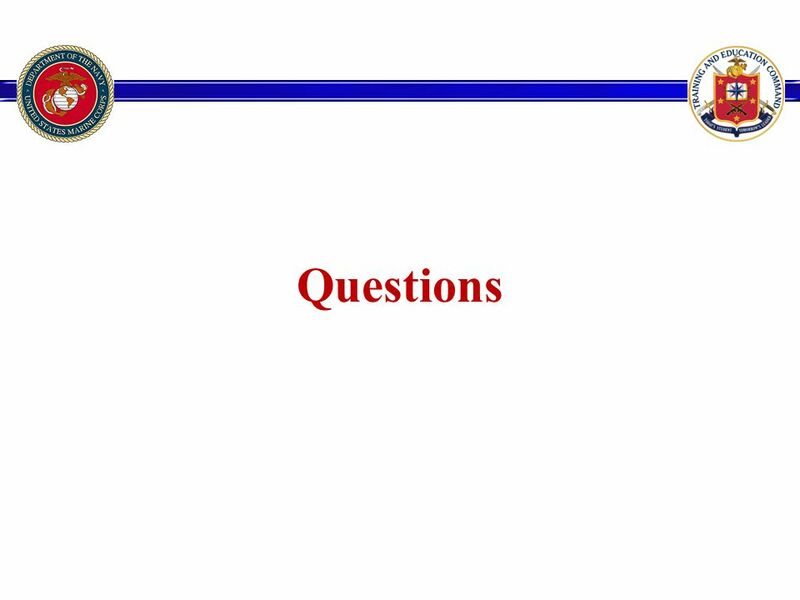 Kansas Private and Out-of-State Postsecondary Education. Horticulture Services at Menlyn Office RAF/2013/00023 Compulsory Briefing Session 05 August 2013 The Road Accident Fund.